The 12th Party Central Committee’s sixth meeting opened in Hanoi on October 4, expected to discuss the socio-economic and financial-budgetary situation in 2017 and draft a socio-economic development plan and financial-budgetary estimates for next year. 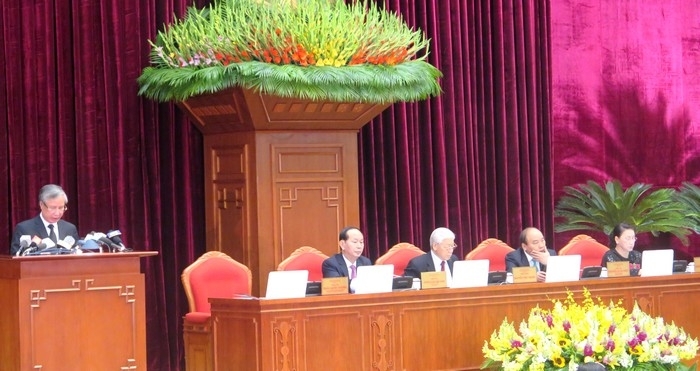 Party General Secretary Nguyen Phu Trong delivered an opening speech and President Tran Dai Quang, on behalf of the Politburo, chaired the first working day. In the morning session, Politburo member Tran Quoc Vuong, Secretary of the Party Central Committee (PCC), head of the committee’s Inspection Commission and standing member of the PCC Secretariat, consulted the PCC about the agenda of the 6th meeting. Politburo member and Prime Minister Nguyen Xuan Phuc delivered a report of the Party delegation to the Government on the socio-economic situation and State budget in 2017 and tasks for 2018. Deputy Prime Minister Truong Hoa Binh, who is also a Politburo member, presented a report of the Politburo on the plan on enhancing protection, care for and improvement of public health in the new situation. Politburo member Pham Binh Minh, Deputy Prime Minister and Foreign Minister, read a report of the Politburo on the plan on population work in the new situation. In the afternoon session, Politburo member and Deputy Prime Minister Vuong Dinh Hue delivered a Politburo report on the project to reform management and financial mechanisms and reorganise public administrative units. Then the PCC members worked in groups, discussing the socio-economic situation and State budget in 2017 and tasks for the next year.